If you have ever been to the awesome town of Seward Alaska, you undoubtedly noticed a rugged, snow covered mountain towering high above the opposite side of Resurrection Bay. If you take a walk along the long city park straddling the shore, it cannot be missed and demands the attention of everyone who visits Seward...even the old billionaire guy on a business trip who cannot fathom sleeping anywhere outside a 6 star hotel. This peak has somewhat of a mystic appeal to it since even the locals won't likely know of anyone who has climbed it, yet they will all know about it, and many of them have probably even hiked the Alice Ridge Trail, which is a popular training ground for runners training for the Mount Marathon Race which takes place on the 4th of July every year. This "secret" trail isn't located on many maps, and you probably won't hear about it unless you know a local, or have stumbled across this page. It's one of only a few trails taking you to treeline in the area. This trail acts as the approach for the ascent of Mount Alice, however the ascent beyond the end of the trail is not easy by any means. A long Class 2-3 scramble of the south ridge is followed by 700 feet of insanely exposed, very loose Class 4 and low 5th eventually bring you to the summit. This mountain's final 700 feet is one of the sketchiest routes I've done, and an incredible level of comfort soloing 4th and low 5th class is a necessity, as utilizing a rope on this route would be asking for death, due to the rope knocking boulders loose. Also, it would actually be wise to do this climb alone, as you would severely endanger anyone else who may be with you at any point you are above them. Do not underestimate the looseness of this mountain, and refrigerator sized blocks perched gingerly on the route are common. All that aside, the summit of this wild peak is something that cannot be matched in very many places. The feeling of looking down on the bay, and the town of Seward to the west, with scores of glaciated mountains to the north and east, and knowing that you're likely the first to stand on its summit in a number of years is very rewarding. The first step would be to get to Seward, Alaska. This small town is located about 2.5 hours south of Anchorage, and offers a pleasant getaway offering every outdoor activity you can think of, as well as excellent restaurants and even a couple micro-brews. This town really explodes in summer, particularly over the 4th of July when the Mount Marathon Race is going on. From the center of town, follow these driving directions to get to mile 3 on Nash Road. Basically head north out of town on AK Highway 9 / 3rd Street for three miles and turn right (east) onto Nash Road. Follow this road as it circles around the head of Resurrection Bay, and after another 3 miles, locate a large pull out on the right side of the road. This is the trailhead, which isn't marked or signed, and is only at 240 feet in elevation. From this parking area, walk directly across the road and look for the beginning of a trail next to where a power line support is located. A piece of colored flagging may mark the trail. Once you pass through the initial bushes adjacent to the road, the trail then becomes very obvious. Follow the trail as it ascends steeply through fairly dense forest and up the ridge, without relenting in steepness for 1,100 feet. Here the trail leaves the forest and emerges into a nice meadow. Follow it as it ascends east, eventually getting onto the narrow ridge that forms the south side of the huge glacial bowl that drops down to the SW of Mount Alice. 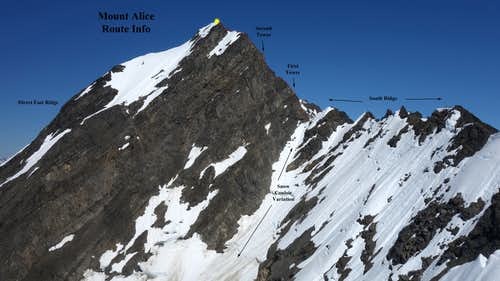 The direct east ridge of Alice forms the north side of this basin, and the trail offers fantastic views of it, as well as Mount Alice itself. The trail more or less ends at a large flat area at 3,100 feet, which will likely be covered in snow well into July each year. Most people turn around here. From the end of the trail, continue east up the somewhat steeper slope directly above you for 500 feet to the top of Point 3,660. An ice axe and/or crampons may be needed as snow definitely lingers here. From the top of this perch, examine the south ridge which lies in front of you. 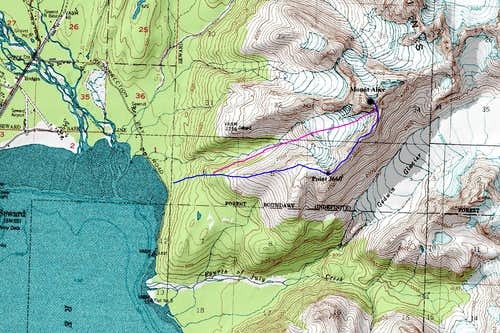 This long traverse to the base of the final 700 foot ascent, although not technically too challenging, will take between 1 and 2 hours to complete. Traverse the ridge north, mostly on the east side of the crest since the west side drops very steeply into the glacial basin. To the east and well below you the enormous Godwin Glacier runs deep into the mountains. There are a few saddles to pass through enroute, but the difficulty should never exceed Class 3. Reach the base of the final climb at 4,460 feet, where you'll be in a prominent notch with a snow couloir heading down into the glacial bowl to the west. When completely snow filled, this snow couloir makes a great shortcut to this key notch and avoids the entire south ridge traverse. Without snow, avoid this gully. Now the fun begins. The 30 foot climb out of the notch is the crux of the whole thing. Locate a 5.0, vertical crack (with good holds) trending up and slightly left directly above the notch, which will dump you out onto lower angle loose talus just above. This crux has probably the most solid rock as well but certainly be careful here. You wouldn't want to fall and go tumbling down the very steep east side of the notch. Make a rightward ascending traverse up the talus and enter a deep, somewhat narrow gully with a distinctive rock tower to the side of it. Climb this gully for about 200 feet, weaving under this tower and up a 20 foot face (Class 4+) to a flat section of ridge in the center up the final climb. Take a break here. Walk across this flat spot until a near vertical wall blocks your progress. Cut right here, and traverse onto a series of blocky steps towards a second distinctive tower above and to the right. Ascend these blocky steps which are covered in kitty litter and small boulders (Class 3), pass beneath the second tower and veer back slightly left to once again reach a mellow ridge section (Class 3+), and scramble easily from here the final 50 feet to the summit. There was a summit register on top and I was the first to sign it in 2016. Return your ascent route to get down, being extra caution to check every foot and hand hold. There are a few places where you will fall if just one hold breaks. There is no red tape to climb this mountain. Camping can be found at the city park along the shore of Resurrection Bay in Seward (expensive and always full in summer), or just up the road at the trailhead for Lost Lake (car camping for free). Camping along the Alice Ridge Trail is allowed but not needed. Carrying overnight gear up that trail would be a chore. This mountain is best climbed when the upper 700 feet is dry, which will be mid May - September. Earlier in season, there will certainly be snow to contend with but by late May the upper part of the route, since it's south facing should be fairly dry. Snow will likely fall again sometime in October.